When looking for a solution to work-life balance issues, popular media and press proposes generalised solutions. At least, this is the appearance if we rely on reports on French labour agreements banning emails after hours (not true, read here) or Daimler-Benz allowing employees to delete work emails received during their holidays. But the issue is more nuanced than this. These generalised solutions, or indeed the categorisations of boundary preferences, group individuals in smaller clusters (e.g. those who want to delete holiday emails, aka separators vs. those who are not bothered, aka integrators). Yet, these clusters still present a wider variability due to personal preferences, work culture, and yes, use of technology. So naturally, the idea of personalisation is starting to emerge even among work-life balance practitioners. Just like the rest of the tech world is moving towards context-aware and personalised ad-hoc solutions, given the many sensors that allow us to have this big data pool to pull from to learn about human behaviour. The flexible working practices that are so worshiped call for a stronger sense of adaptability – or agility, to use software engineering terms. Some argue the consequential need to develop e-resilience, which was the focus of a workshop by the SOCRG group. But the concept itself has a negative connotation and suggests that extreme flexibility is an issue and the problem may well lie in the use of technology. While this may be the case for some (however large the group), it most certainly isn’t for others, who welcome the work-life enrichment  technology provides. When talking about issues that everyone can relate to, like work-life balance and email overload, we need to be careful in presenting realistic and panoramic pictures of reality. Else, we are only approaching one side of the problem. The essence of flexible working is in the ability to take control, rather than reacting to issues. But perhaps, rather than mindlessly suggesting personalisation as another form of ‘one-size-fits-all’, we should think more carefully what personalisation means. One way is to think about the distinction between personalisation and customisation . Personalisation sees the system being tailored to the user’s preferences, but leaving them passive; whereas customised solutions offer the user the option to choose the options that best suit them. By giving users more control, users can fully take advantage of the flexibility that has fragmented not only the time and space in which we work, but also the many identities one slips in and out of throughout the day. In fact, we now have microboundaries to manage as a result  that require lots of digital housekeeping  around what is public and private, what is online and offline . Once we have acknowledged that individual variability needs to be accounted for, the next logical step is to think about how we might communicate this to others, because. Boundary theory, despite being grounded in social constructivism, has a very solipsistic approach so it doesn’t really offer a lens to understand how we might go about communicating to others. Yet, technology has made it very easy to blur boundaries so, now more than ever, we need ways to talk about boundaries and manage expectations to guard our flexibility and sense of control. Provided that every job culture is different and has a strong impact on how we perceive and experience (our and others’) boundary management, how do we manage expectations? In an ideal world, we would sit down with our colleagues and boss, and have a fulfilling discussion about everyone’s preferences and come to some sort of agreement. But in reality, there are too many emails, too many tasks, too many meetings to stop and think about these issues. Some people just might not care, and not everyone may be accepting. So what is left is the opportunity to communicate unilaterally one’s preference, or tell ‘butler lies’ , when the culture is not (perceived) accepting. But is there room for negotiation? How might this occur? Is negotiation the right term? Does technology have a role? Several discussions on the day happened around best practices for company policies, with one conclusion being that, actually, companies should not enforce solutions, as suggested in the Going Off The Grid conference, organised by Barbara Neuhofer and Adele Ladkin. In fact, there is evidence to suggest that if guidelines were created, these should take into account those individual differences, as well as professional differences . Perhaps these guidelines should also be on a spectrum, just like people’s preference for boundary management slides across an integration-segmentation continuum. What is left to the end, and still remains an open question, is what role does technology have in all this? Back in February I took part in the Material Desires workshop led by Paulina Yurman (from FamilyRituals 2.0) and really enjoyed using provocative designs to re-think my everyday practices at home and at work. However, I was surprised that none of the discussions or even the probes focused much on technology. Yes, emails were mentioned here and there, but there is so much more than email when it comes to work-life balance and technology. Like Barely et al  found email is a symbol of stress, a representation of tasks, duties, and responsibilities that hang over our head. We can all agree that there are lots of problems with email, but it’s stuck around for more than 30 years so it can’t be that bad after all. Email is just the one, most popular example though. The truth is that technology seems to have fallen in the background, it’s everywhere and we have stopped noticing it. And this may be why concepts like e-resilience emerge, because they lack the technological point of view that can emphasise its intrinsic and existing benefits. Like the fact that I can see if my mother is on Skype on the other side of the world when I want to have a chat. We are seeing a hyper-mobility, which changes patterns of living, practices and expectations. We go away from a weekend because Richard Ayoade shows us how cheap it can be to go to Marrakesh [if you haven’t, watch the Travel Man – it’s brilliant! ], we hop on a train to attend a meeting in another city in person, we pack our days and to-do lists to feel busy. Always on the go. So naturally, if we are running around all day, always connected, always available, it is only obvious that we expect others to be doing the same. Is this what we want though? Do our behaviours match our values? And if not, how do we make them overlap? Is technology helping us or hindering us in this task? There is a common idea that technology has had an incredibly positive impact, among other things, on our productivity. Most of the focus though remains on the negatives. Together with common complaints about email, notifications also seem to have a steering force, interrupting and challenging our boundary preferences. Very little was touched upon throughout the day. In the Reconceptualising Work-Life Boundaries session led by the Digital Brain Switch our table did discuss the effect of having to manage multiple online personas, multiple channels, multiple platforms and wondering whether users think about other people’s preferences and how that affects communication. More unanswered questions. The one session that did explicitly leverage on technology to learn more about one’s own practices was that led by Rowanne Fleck from Digital Epiphanies on LifeSwap for personal data. Similarly to Paulina’s Material Desires workshop, interesting conversations seemed to have sparked when comparisons between users and data had a large discrepancy and had almost a provocative effect. Given that technology has become so pervasive that we see just through it, how can we put it back in the foreground? How can we make people more aware of it, so they can regain control and match behaviours to values? 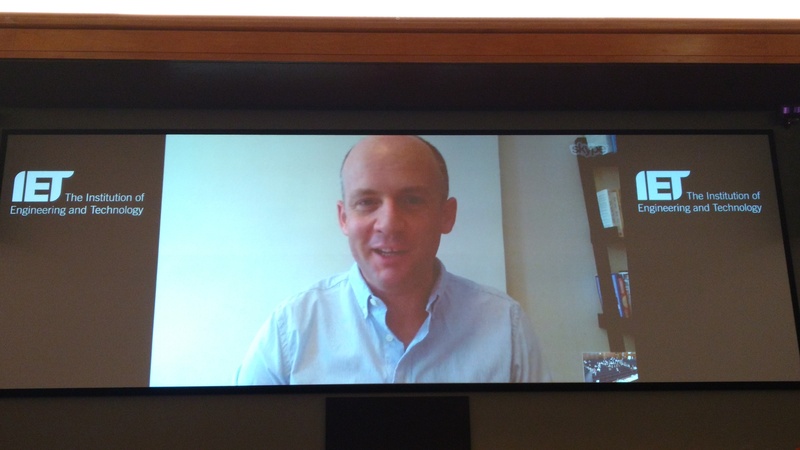 The Beyond Balance event seemed to have ended with an open question and an invite to understand how technology can both support and perturb the possibility of work-life balance, which is lacking in the current discussions. I believe that “just because we can, doesn’t mean we should”, both in terms of how we design technology and how use it for boundary management purposes. Policies focus on what you should or shouldn’t do, whereas I argue that we should be looking more at how to make sure what people can do matches their behaviours to their values, by making sure the next generation of communication technology is designed to not get in the way. Cecchinato, M. E., Bird, J., & Cox, A. L. (2014). Personalised Email Tools: a solution to email overload. In CHI Personalized Behaviour Change Technologies Workshop. Cecchinato, M. E., Cox, A. L., & Bird, J. (2015). Working 9-5? 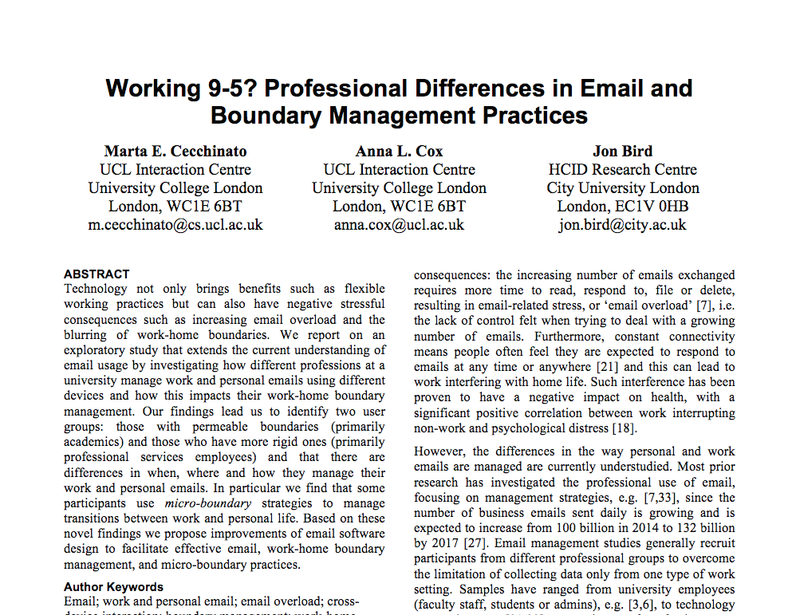 Professional differences in email and boundary management practices. In Proceedings of the 33rd Annual ACM Conference on Human Factors in Computing Systems (pp. 3989-3998). ACM. Whiting, R., Roby, H., Symon, G. and Chamakiotis, P. (2015). Digi-housekeeping: A New Form of Digital Labour? In: WORK2015: New Meanings of Work, Stream: ‘Reconceptualizing Work’, August 19-21, Turku, Finland. Cecchinato, M., Fleck, R., Bird, J., & Cox, A. L. (2015). Online vs. Offline: Implications for Work Identity. 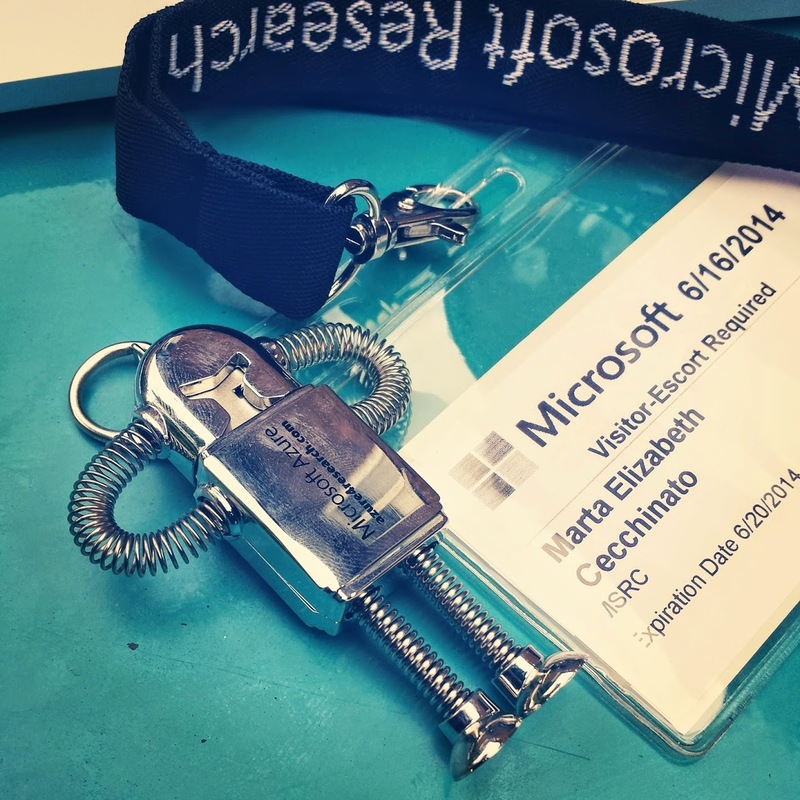 CHI Between the lines: Reevaluating the Online/Offline Binary Workshop. Hancock, J., Birnholtz, J., Bazarova, N., Guillory, J., Perlin, J., & Amos, B. (2009, April). Butler lies: awareness, deception and design. In Proceedings of the SIGCHI Conference on Human Factors in Computing Systems (pp. 517-526). ACM.